It will be a tough job to find someone who has not heard about the Louvre. This is, after all, one of the most visited museums in the world, drawing almost ten million visitors annually. In fact, if you do not count the Forbidden Palace in Beijing as being a true museum, the Louvre comes out on top of the list, almost three million visitors ahead of the British Museum in London and The Met in New York. There are plenty of reasons for this, one of them being that Paris is one of the most beloved cities in the world among tourists. Since Musee du Louvre in Paris is huge, you should set aside at least two-three days to go through all the exhibitions. Unless you know exactly where to go and what you want to see. Most people crowd in front of the Mona Lisa, at times in so vast numbers that most visitors are not able to see the painting at all, unless willing to spend a few hours queuing. 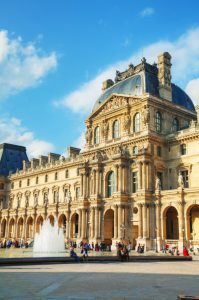 There has been activity in the Louvre since the 16th century, and the huge amount of art pieces and artefacts from ancient civilisations is still growing. Even though most visitors prefer to focus on paintings by the great Leonardo da Vinci and others, a big chunk of tourists head straight for the Egyptian collection, consisting of more than fifty thousand objects. Here, you are able to follow the great Egyptian empire from its early beginnings in the 4th millennia BC, until its last days. The Greek, Etruscan, Roman, Iranian, Mesopotamian and other areas of the Louvre in Paris are also frequently filled up with visitors, at any given day of the week. Given the huge budget that the Louvre administration possesses, millions are spent every year on acquiring new art from over the globe. This process has forced government agencies out of the Louvre in Paris, where they were holding on to much needed floor space. After the Ministry of Finance left the Louvre in the 80s, the magnificent museum could finally welcome art-lovers to all of its parts. Just in front of the Musee du Louvre in Paris, you will find a big glass pyramid, which, along with the Louvre itself and the Eiffel Tower not far from here, has become a symbol of France. Above ground, the glass pyramid is a popular place for taking photos of the Louvre. Underneath, an inverse pyramid is found, acting as a skylight to the busy shoppers of Carrousel de Louvre shopping mall.